After the binge of last week, having no NCAA Tournament games feels a little cold, but luckily we've got tickets to New York to punch in the NIT. The first two of four quarterfinals have our attention here on this week's edition of Tuesday's Top Picks, along with an NBA play looking to capitalize on the reasons for the Charlotte Hornets' recent string of success. It's hard not to like the fact that this Hornets team, loaded with recent college stars, is thriving during March Madness. Devonte Graham, Frank Kaminsky, Jeremy Lamb and of course Kemba Walker all experienced success at some of the highest levels of college basketball, so when Lamb buried a deep buzzer-beater against the Raptors it just seemed to fit the NCAA Tournament-inspired energy that sweeps the sports landscape at this time every year. Let's get to my favorite picks of the day. The Shockers have taken impressive leaps forward in the last calendar month, holding an 8-1 record with the only loss coming to eventual champion Cincinnati by three points in the semifinals of the American Athletic Conference tournament. Postseason wins over Temple, Furman and Clemson represent some of the best wins Wichita State has on the entire year, so I trust Gregg Marshall's team continuing that level of play more than Indiana's chances to extend the season with Romeo Langford questionable. I might even like Wichita State on the moneyline as well, but given the road environment, taking the points is a must. 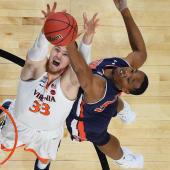 The SportsLine Projection Model has simulated this matchup 10,000 times and loves one side of the spread, which it has cashing in 62 percent of simulations. You can check out that pick, as well as the computer's lean on the total, over at SportsLine. Twice Jamie Dixon has led teams to non-NCAA Tournament postseason championships, winning the 2012 CBI with Pitt and the 2017 NIT with TCU. No coach sets out to establish a reputation as one of the winningest coaches around when you don't make the Big Dance, but Dixon's history suggests he does a good job of keeping the staff and the roster focused after the disappointment of ending up on the wrong side of the bubble. TCU gets the home win against Creighton and the cover, advancing to the Big Apple for the NIT semifinals. The SportsLine Projection Model has simulated this matchup 10,000 times, and while the line appears to be set at the right number, you'll want to check out what the computer has to say about where the value lies before locking in your pick. Hornets coach James Borrego has gotten a great showing for this team's younger players here in the final stretch of regular season play, and the real key to their success has been a more up-tempo pace and ball movement. Kemba is obviously still the focus of this offense, but Miles Bridges, Devonte Graham and even Dwayne Bacon have provided valuable contributions in this three-game winning streak. Instead of slowing down here in the final dozen games, Charlotte has a second wind. No play on the side, but I think the game flow takes this total over the number. Looking for the strongest possible play on Tuesday? SportsLine has run the numbers and is picking one side of the Wizards-Lakers matchup in 70 percent of computer simulations. Before you settle on your pick, you'll want to check out what they're saying.